Product Description:In many ways small towns are alike. One of the most common similarities is the big house on the hill. On the highest point of land lives the town's banker, doctor, pioneer land owner or other prominent person. And often this residence is an active social center for the community. Such a story is recounted in this painting, a familiar remembrance from the artist's small town background. Product Size:Image size, 12" x 16". Framed size, 15" x 19"
In many ways small towns are alike. One of the most common similarities is the big house on the hill. On the highest point of land lives the town's banker, doctor, pioneer land owner or other prominent person. And often this residence is an active social center for the community. Such a story is recounted in this painting, a familiar remembrance from the artist's small town background. All the lights in the big house have been turned on, a sign of welcome for arriving guests. The dog knows from experience that when this happens company is expected, and he waits on the road with anticipation. Below the big house we see other familiar small town sights-the square, the church and, barely visible behind the house, the school building. The romantic spell of this cold and hazy evening is intensified by the glowing lights, and we can be readily transported back to an era when one took the time to get to know their neighbors. Master Stroke Oval open edition. Image size, 12" x 16". 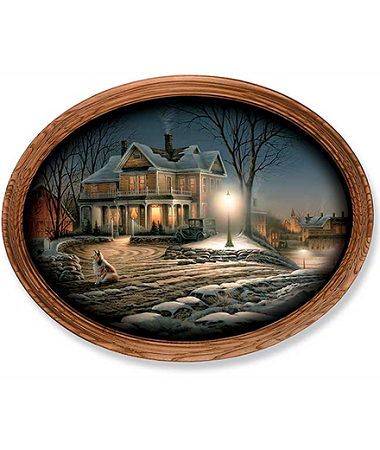 Framed size, 15" x 19" with an oak-finished oval molding.